We were lucky enough to see Yael Frischling’s collection on the runway at the 2017 UTS graduate parade.. and quite honestly, we were blown away. 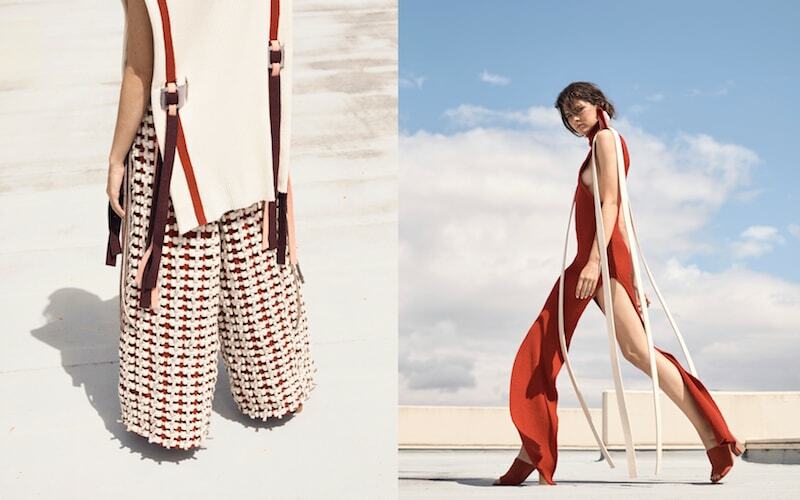 It’s no surprise that her creations also caught the eye of sustainable fashion queen Clare Press who recently featured the collection on Marie Claire. Here, we shine the spotlight on Yael to find out more about her design process and plans for the future. YOU CREATED SOME INCREDIBLE INTRICATE WEAVING & SCULPTURAL DESIGNS, WHAT IS IT ABOUT THIS TYPE OF WORK YOU PARTICULARLY LOVE? I love exploring one idea to its fullest extent. The weave I developed was a three-dimensional joinery system that utilises zero waste cutting techniques. Both the sculptural pieces and the intricate woven pieces are assembled in the exact same way, only one is in a large scale to create form and the other is in a small scale to create texture. Using scale to present my ideas was my attempt at demonstrating the joinery to its fullest extent. I enjoy creating work that forces the viewer to question what fashion is about. When you see something out of the ordinary, that’s big and bold and in your face, it forces you to think about why it was created in the first place. If a collection is sculptural and less wearable, what purpose does it serve? Maybe fashion is about more than beautiful clothing, maybe it’s an outlet for presenting new ideas to the design industry as a whole. I contrasted this attention demanding sculptural collection with intricate weaving to draw the viewer in and present my ideas on two considerably varying scales. CAN YOU EXPLAIN A LITTLE ABOUT THE CONCEPT BEHIND YOUR GRADUATE COLLECTION & YOUR CAMPAIGN IMAGES? My collection, Kumiki, is inspired by Japanese joinery systems within architecture. The garments are assembled using a series of self-developed, unconventional interlocking systems combined with traditional needle punching. There is no sewing or fastenings required. I used these interlocking systems to create a collection that challenges the conventions of traditional garment making resulting in sculptural silhouettes and intricate woven textiles. The three-dimensionally woven wools are assembled in varying scales to span the predominantly zero-waste cut pieces. My intention with this method was to create an interactive element and ethical approach to the production of fashion. I want the viewer to question where concept ends and fashion design begins. Because my collection is so sculptural and technically led, I wanted a campaign that reflected that. The shoot was done on a rooftop with clean blue and grey skies in the background. I did not want anything distracting from the concept, and I believe that using the sky as a background created a sense of elevation for the collection. The roof was industrial, but with clean lines, adding in a further element of architecture to the clothing. I wanted the collection to speak for itself, so we kept the campaign bold and minimal. WHAT DID THE 24 HOURS BEFORE YOUR GRADUATE PARADE LOOK LIKE? The day before the show, I went through each garment and did a bit of quality control, clipping threads and reinforcing weaves. I am not one to procrastinate, so everything was pretty much ready to go for the next day and I was in bed by 9pm. I was so nervous that I barely slept. The day of the show was such a blur. I spent my time running around, eating whenever I could, and checking to make sure everything was going to plan. The girls that helped me dress my models were amazing and took such great care of my garments that I barely had to do anything. Everything went super smoothly and it was over so quickly. I wasn’t too excited for the show, but once it ended, I realised that was one of the best moments of my life. I can’t stop smiling just thinking about it! WHAT IS THE FIRST PIECE OF FASHION YOU EVER LOVED? I never knew much about fashion design until I started studying it. I chose it because I thought it would be fun and easy and after I graduated I could start my own bridal wear label. I remember in my first year at university, everyone was asking me who my favourite designer was and what my favourite label was- I had no idea, so I just kept saying Celine, Celine, Celine. However, in one of the first lectures I sat in, Todd Robinson, the head of the Fashion department spoke about Hussein Chalayan and the aeroplane dress from his 2000 spring/summer collection. The dress was created using aeroplane construction and operated with a remote control. I remember being surprised by how intelligent design can be and it gave me a newfound love and respect for the discipline. From then on, I took fashion design very seriously and tried to approach the course from an intellectual, concept led position. WHERE WOULD BE YOUR DREAM PLACE TO WORK IN THE FUTURE? My dream would be to work in a design studio with people from various design disciplines. I’d love the opportunity to work with architects, product designers, interior designers, etc… to develop new ways of creating and approaching designs. If it weren’t for my friends studying architecture and product design, I would not have been able to design this collection. We were constantly sharing our knowledge and bouncing ideas off each other. I’d love the opportunity to continue working in that way. I’d love to go straight into the workforce and gain some industry experience. I’m considering moving to New York and potentially working there, but I’m open to wherever life takes me. At the moment, I’m not ready to go back to studying and I’m definitely not ready to start my own label. However, those are two things I’d definitely like to pursue in the future.